The winter ‘storm’ is howling around the house, it rained quite a lot most of the afternoon. A good opportunity to stay at home and do some Islay blogging and make progress on the Two weeks on Islay in June 2007 travelogue. Or combine both and pick an Islay picture from the pictures I'm currently looking at as this week's Friday Islay Picture. 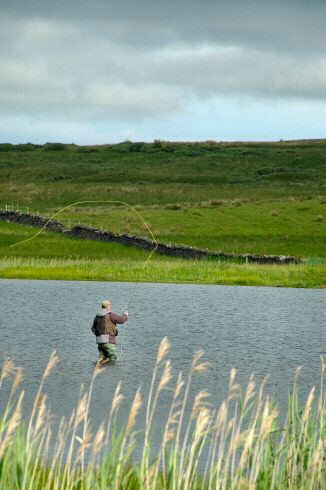 It's a picture of someone fishing in Loch Finlaggan, quite close to Eilean Mór. I'm not entirely sure, but I think I took the picture from the wooden walkway to the island (or at least close to the walkway). The sun was breaking through occasionally, providing some nice light despite a mainly cloudy day.